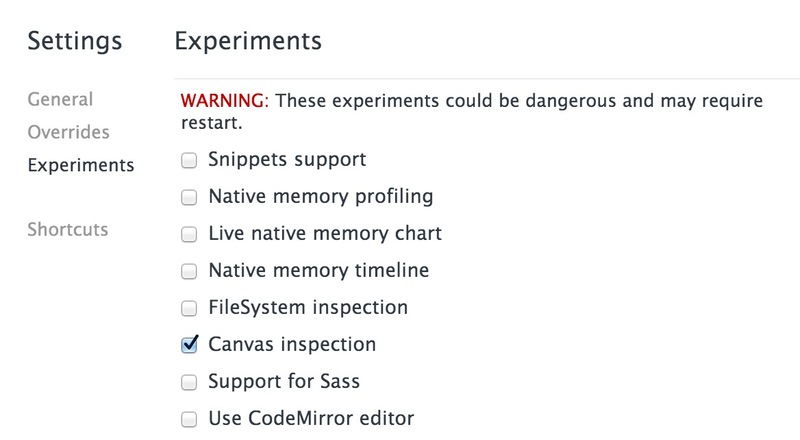 Paul Irish showed off a cool new feature of the Chrome DevTools called Canvas Introspection in a talk at EdgeConf. Make sure to watch Paul's talk for the cool things you can do with it. Thanks for the tip. This is no available in the latest stable version of Chrome. No need to install Canary if you don't want to. I have a problem. Even if I enabled "Enable Developer Tools experiments." the inspector doesn't show these options (chrome://flags/#enable-devtools-experiments). It shows something different like, FileSystem inspection, Canvas inspection, CSS Regions Support,Show Overrides in drawer etc.